-Most of our business practices and processes don’t reflect this reality. My belief in the power of unintended outcomes goes back to my reading all of the great Scottish enlightenment thinkers for my degree at Glasgow University in the early 90’s. I have also spent a great deal of my career working with quantitative market research data and, therefore, working within a business culture that is striving for reliable ‘prediction’ of outcomes…. So I feel a powerful ambivalence when I reflect on much of the new thinking around ‘real time’ and ‘big data’ in marketing and NewMr. Big data promises unprecedented support for decision making. Many feel that it is struggling to deliver on that promise. We are simply overwhelmed by the complexity of big data. Behavioural economics and decision science tells us that we don’t like novelty and uncertainty. Marketers and researchers are people too. We are prone to all of the same biases (confirmation bias, availability heuristic, representativeness bias, bounded awareness etc. etc.) as the people we increasingly choose to characterise as ‘irrational consumers’. So it’s natural that we seek out ways of simplifying and reducing the ever growing river of data to manageable levels. But one unintended consequence of this need for reduction is that we become over-reliant on a rapidly growing range of algorithms and dash boarded decision tools that narrow our focus to the point where we marginalise the richness and complexity that was supposed to give big data its power in the first place. Serendipity drives a great deal of game-changing thinking and innovation. It would be a big mistake if we let data technology crowd oblique thinking out of our professional lives. Of course, it doesn’t have to be like this. We don’t have to be bounded by the direct routes offered of our dashboards and KPIs. Technology and creativity should go hand in hand. Here is Brian Eno being interviewed by Jeremy Paxman on Newsnight in 2011 . Eno’s whole career is founded on harnessing new ideas and technology to invent new disciplines and genres. He was on Newsnight to talk about whether creativity is heightened in challenging economic times. But in his own oblique way he ended up making more interesting connections about technology’s role in his latest projects around ‘generative music’ and open source methods of creative collaboration. Eno gets these breakthrough outcomes because of the way he approaches new information and technology. Obliquity is built in to everything he does. Back in the 1970’s, along with the British painter Peter Schmidt, Eno realised that the pressure introduced by commercial objectives and deadlines (the clock ticking on expensive recording time in the studio etc.) was causing him to lose touch with his most productive methods of working. 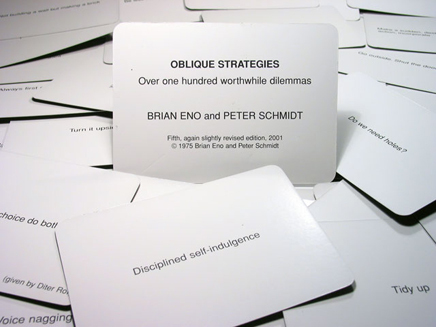 You can read more on the origins of Oblique Strategy cards here or on Eno’s own website. David Bowie is also a great fan of obliquity. Here he is discussing the ‘cut up’ techniques that are a core part of his creative process. Does any of this sound familiar? If Eno recognised these blockages and pressures in the liberal avant garde music scene of the 70’s what is the impact on the humble time poor research or marketing exec in the world of real time big data?